Will 2017 Be the Year of the Cloud-Based Websites & Mobile Apps? 1. Research: You can’t take SEO services from any company without proper research. This is the first rule while planning to double your sales. You have to search for proper keywords that target your business and that are mostly searched. If you target keywords the wrong way, you might end up getting least traffic on your site. 2. Use short keywords: Never use long keywords for your organization’s SEO strategy. Why? It leads to low conversion rates and higher bounce rates. Short and precise keywords yields the best of results for your business. For eg: if you are an online bakery, you can use keywords like “best online bakery” or any other that best describes your business. Avoid competitive keywords that encompass higher level of competition since this diminishes your chances of getting a relevant rank. For best results, it’s always recommended to integrate Google Webmaster Tools, Google AdWords & Google Analytics. They’re all free! 4. Keywords Strategizing: When your website has more than one page and they target the same keywords, there’s a lot of confusion for search engines to assign proper ranks. And you can lose a top spot on search engines. To avoid this, you need to have a planned strategy of keywords for all pages. Do that smartly! It helps. 5. Monitoring and working on it: You can’t take a break from the SEO process. Once you start, you need to continue with it. Also, keep spotting problems with duplicate content, indexing and others. Fix them right away. Duplicate content can lead to blacklisting of your site. So never have duplicate content on any of your pages. Keep it unique. 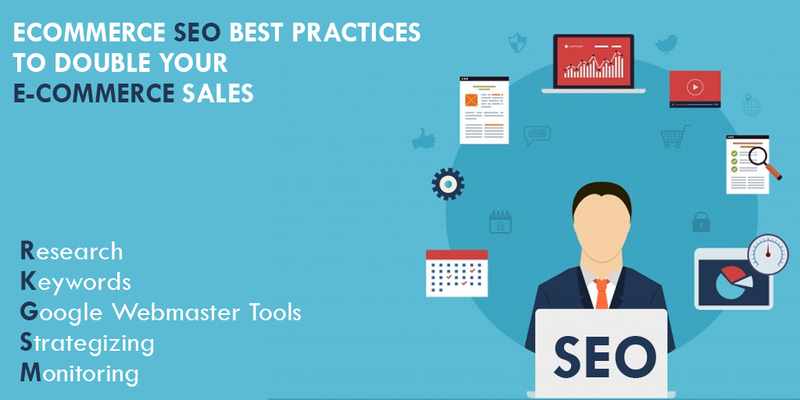 These practices once followed by you will surely help you double your e-commerce sales. So start planning your SEO strategies smartly. It leads to more happy users and a better business. How is artificial intelligence helping the e-commerce industry?